Great place and close to restaurants and entertainment. Friendly staff and great amenities. Staff friendly, room very big. Breakfast was good. Unlimited entries to the affiliated Water Park are included as well as a single entry to their affiliated private beach/pool on one of the Palm islands. The subway station is only a few minutes walk away from the hotel so if you miss the hotel shuttle to the Dubai mall, you can still easily reach it by subway. This hotel exceeded my expectations in every way. The facilities were immaculate, and the people were outstanding. This is a beautiful property that I wholeheartedly recommend. The breakfast far surpassed any other complimentary breakfast I have ever received at any other hotel. The pool and rooftop views were amazing. It is very close to the Dubai airport. Centrally located and always has a cab waiting for you. Beware of black cars in Dubai. They charge a lot more than cabs. My stay was short, lest than 24 hours but very pleasant. Would like to stay longer next time. I stayed at Jumeirah Creekside for one night on 5.22.17. I got in to Dubai in the morning and they let me check in early...by 10am! It was awesome because I was exhausted. Check in was easy, staff was friendly and professional. My room was perfect, Spacious, clean, and well designed. I stayed in a suite on the third floor. The bed was super comfy and they had blackout curtains so I was able to easily nap. They also have a free shuttle bus that takes you into town. I got dropped of at Dubai mall and went to see Burj Khalifa 'at the top' and bought some treats from the mall. Then I boarded the shuttle to the El wadi water park where admission is free if you show your Jumeirah room key. Overall this hotel is excellent and all the extras it provides makes it luxurious. I will definitely stay there again. Hotel is great! The staff are very friendly and helpful, room was spacious and had everything a hotel room should have to be comfortable! For you art critics out there, the Jumeira Creekside really pulled out the stops- to make it a pretty hotel. I liked the red & black colour scheme throughout. The multi-storey atrium is bright & beautiful; a work of art. The actual paintings, concentrated on the lower lobby- add to the overall art museum atmosphere. Artistically, the rooms continue the modern art theme. My room was clean & well- lit, with working wifi & internet. Upon arriving ill, the staff was nice enough to send me a get-well card, & some soup. If you're spending minimal time in the rooms- the size is okay. Otherwise, it's a bit small for a luxe hotel. For those of you who are affected by a noisy stay; there was a disappointing level of neighbor noise, throughout my stay. There should have been some significant soundproofing- to complement the efforts spent beautifying the Jumeira Creekside. A shame. from the moment I got out of the taxi it was a wonderful experience. The staff was extremely accommodating. I received an upgrade to a suite, which was absolutely amazing. The only drawback was that the room faced the Irish Village and the noise level was quite high. But overall it was simply amazing. Awesome stay. Staff was extremely helpful and it was very close to the airport. Hotel amenities in room and out were top notch. Will recommend and be staying again for sure. I splurged a bit for my stay during my 12-hour layover and decided to stay at this hotel because it was close to the airport, nice area, spa services were available, and variety of restaurants. The taxi ride from the airport was around Dhs 30. The entrance took my breath away once I walked in. I had to wait a moment for check in; however, one of the attendants took my drink order and comfortable seating was available. My bag met me at my room, which was beautiful. Everything was updated and modern. The light feature tickled me pink; with a touch of a button the curtains closed, the lights dimmed, and I was ready for bed. I lucked out and the spa and nail salon was on the same floor. There were renovations going on; however, I didn't feel like my experience was shortchanged. I grabbed a drink and bar snacks at the Cuba Lounge. Swanky atmosphere and amazing view. I ordered Noodle House in, but there were restaurants in the hotel and nearby. I love the Deira area. The mall is nearby, several American restaurants to choose from within walking distance, and the Irish Village is great for socializing. Check out was easy and I look forward to staying here again. This stay definitely made my 15-hour flight to the states bearable. I was able to relax and get pampered. Located in Garhoud within a 5-minute walk of Dubai Tennis Stadium, Jumeirah Creekside Hotel is within a few miles (5 km) of other popular sights like City Centre Deira. This 292-room, 5-star hotel has 2 outdoor pools along with a full-service spa and a free water park. There are multiple options for onsite dining with 4 restaurants, including Nomad, which specializes in international cuisine and serves breakfast, lunch, and dinner, and Plumeria with its garden views. Satisfy your hunger without leaving your room with 24-hour room service, or quench your thirst with a beverage at the bar/lounge or coffee shop/café. Buffet breakfast is offered for a fee each morning from 6:30 AM to 11 AM. Guests can expect to find free WiFi and 42-inch an LCD TV with satellite channels. Select Comfort beds are dressed in premium bedding and the bathroom offers a soaking tub, a rainfall showerhead, a hair dryer, and designer toiletries. Other standard amenities include free minibar items, an iPod dock, and a refrigerator. 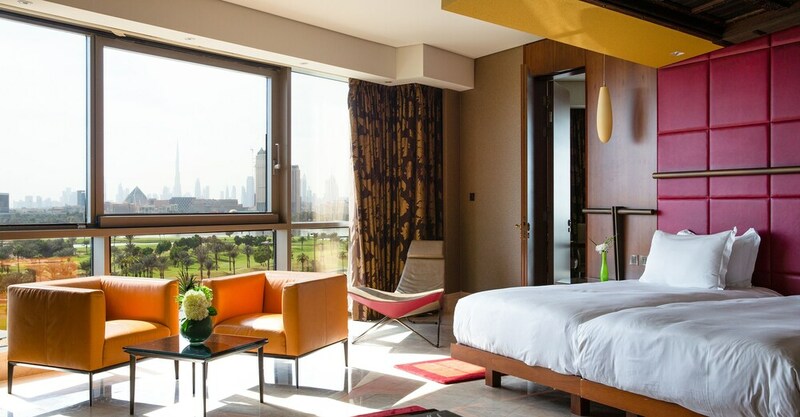 Jumeirah Creekside Hotel features a full-service spa, 2 outdoor pools, and a free water park. You can take advantage of free valet parking, along with an airport shuttle (available 24 hours) for AED 150 per vehicle one-way. The front desk has multilingual staff on hand 24/7 to help with tours or tickets, luggage storage, and dry cleaning/laundry. Other amenities at this luxury hotel include a fitness center, a spa tub, and a sauna. well situated hotel with friendly staff. We sincerely appreciate your feedback. Thanks for staying with us and we look forward to welcoming you back soon at Jumeirah Creekside Hotel. Thank you for sharing your review. We’ve noted your comments and we apologized for the inconvenience experienced. Rest assured that your feedback has been shared with the team to look into it. We look forward to the opportunity of welcoming you back in the future. Nomad - Garden-view restaurant and bar specializing in international cuisine. Open daily for breakfast, lunch, and dinner. Alfresco dining available (weather permitting). Plumeria - Garden-view restaurant specializing in international cuisine. Open daily breakfast, lunch, and dinner. Alfresco dining available (weather permitting). Cu-ba - Poolside rooftop bar specializing in Latin American cuisine. Open daily for lunch and dinner. Alfresco dining available (weather permitting). Crimson Gallery - Restaurant specializing in international cuisine. Open daily for breakfast, lunch, and dinner.
. - Restaurant. Open daily. Guests can splash around at the waterpark, and other recreational amenities include outdoor tennis courts and indoor tennis courts. The hotel has 2 outdoor swimming pools and a spa tub. A sauna and a fitness center are other recreation options. The front desk is open 24 hours a day, and checking in and out are easy with express services. For convenient arrivals and departures, you can take advantage of the airport shuttle (available 24 hours), which is offered for a fee. Driving? This property offers free valet parking. The following credit cards are accepted: American Express, Diners Club, Mastercard, and Visa. Guests must contact this property in advance to reserve cribs/infant beds and rollaway/extra beds. This property considers guests aged 11 and under, at time of travel, to be children. For more details, please contact the property using the number provided on the booking confirmation email. Children younger than 12 are not permitted in the Club Lounge. For more details, please contact the property using the information on the reservation confirmation received after booking. The Club Lounge is open 2-11 PM daily. For more details, please contact the property using the information on the reservation confirmation received after booking. Book a stay in any room or rate category and receive unlimited access to Wild Wadi waterpark, beach, and complimentary shuttle service. Book a stay in a "Club or Suite" room category and receive complimentary access to the beach (once per stay).